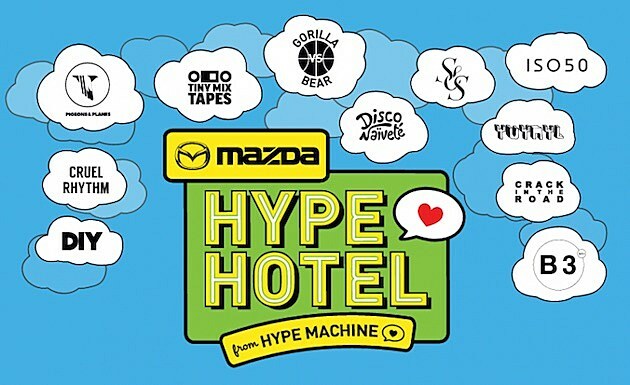 Mazda + Hype Machine’s Hype Hotel returns to this year’s SXSW with six whole days of music from March 14-19 at 1100 East 5th Street. They announced the schedule and lineup, which, as always, was curated by different music blogs like DIY, Pigeons & Planes, Gorilla Vs. Bear, among others. 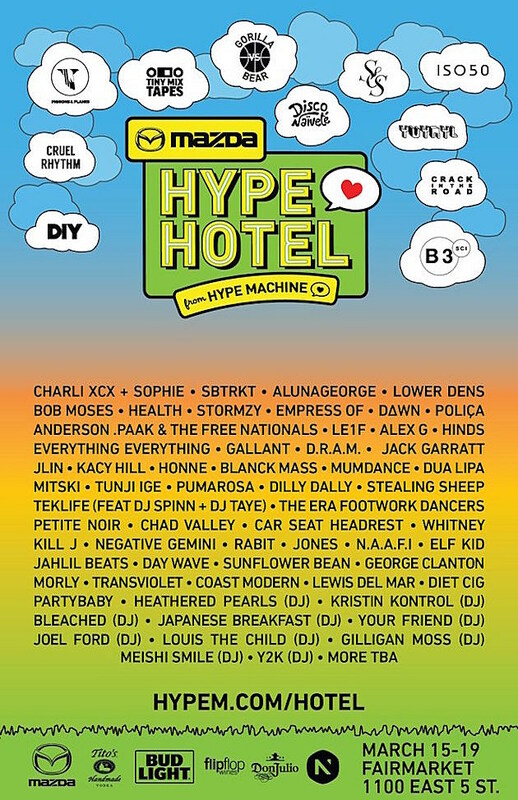 The full lineup includes Polica, Empress Of, Jack Garratt, Alex G, Car Seat Headrest, Stormzy, SBTRKT, Lower Dens, Hinds, Charli XCX, Anderson Paak, HEALTH and loads more. We’re giving away 5 Mazda #FastPass + guest per session, use #FastPass and you may win to skip the line! Winners will be selected randomly through Twitter. For more details, go HERE. – Mazda’s exclusive projection and audio installations include projection mapping where guests can control the content they see on the display car outside as it becomes a canvas of custom looks and environments. – Spectrum Analyzer located inside Hype Hotel venue uses LED lighting to curate patterns of soft colors to the music in the background. – Mazda Artist Lounge – a relaxed environment for Artists, bloggers to unwind and have a moment to get away from the crowds. – Mazda Studio – teaming with La Blogotheque to provide a space for artists to provide intimate performances and in-person interviews.